Ornithology is the scientific study of birds and Steve Boyes of Percy FtizPartrick Institute of African Ornithology has his own name in the science of birds. Here we present to our readers his collection published in Explorer Journal on February 9, 2012. Sunbirds are orange breasted birds endemic to S. Africa. Sighting a Cape gannet with outstretched wings is a wonderful experience. African firefinch is one of the common species of Africa with a distributional range of 5400000 km2. Have you ever seen a Southern masked weaver eyeing directly to you while making a nest, if not then cherish Boyes experience. Great white pelicans are real survivors and seeing a real survivor could be an amazing experience. 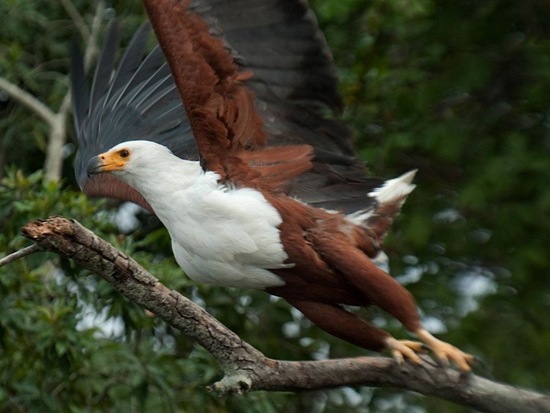 Fish Eagles of Africa, a marvelous take off photo to watch. Egret sitting on the back of a zebra is a nice experience to witness. You may find one hovering over fields in your village as these black shouldered kites are common scene from Africa to China. The tough grey hornbill in rough woodlands in Africa. Seeing a lilac-breasted roller in the bright sunlight could be delight for the photographer as a natural wonder. Cross-eyed jackal buzzard is another stunning raptor which can be seen sitting on powerlines in Africa. African jacana searches for food but becomes a great inspiration for the photographer. One of the most prolific parrots in India, rose ringed parakeet are able to establish a feral population. The meaning of freedom becomes more vivid when we see scarlet macaws flying high free and wild. This stunning photograph of Chinstrap penguins on an iceberg are an amazing scene. This white tailed sea eagle and Japanese crane in amazing action scene. The endemic Puerto Rican Tody photographed near San Pedrito de Puerto Rico. Shoebill from Africa is an enigmatic and little known bird to the world but it has reached to the brink of extinction on the hands of trappers. Brown headed parrots prefer low lying rivers and coastal forest. This bird also is near the extinction for illegal capture. These subspecies of Eurasian coot are found in the Old World on freshwater lakes and ponds throughout the world. Kingfisher having a small fish in beak was a stunning caught for the photographer.